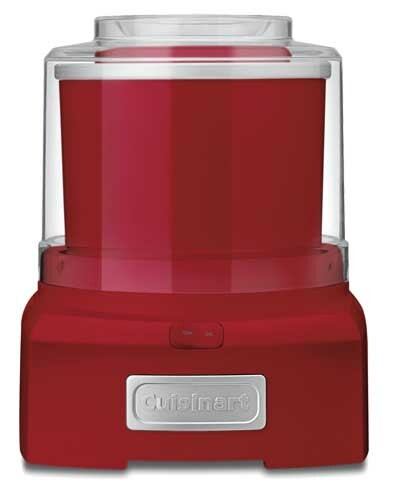 From Cuisinart comes the ICE-21, a very reasonably priced ice cream maker that will also create frozen yogurt and sorbet right in your own home – and all in under 20 minutes. This model is a top seller on Amazon in Ice Cream Machines, with good reason. 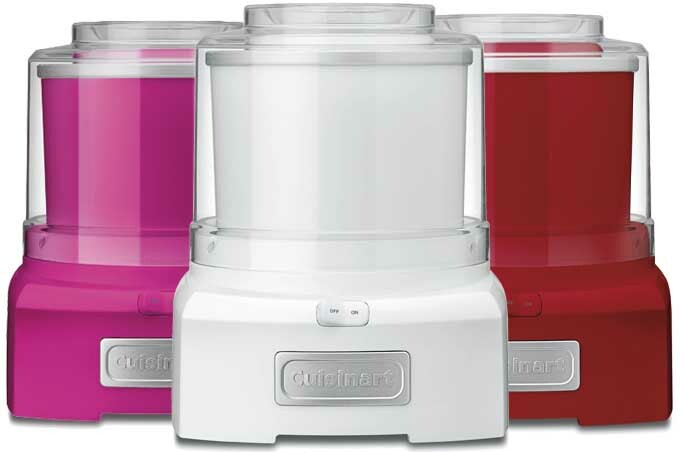 A heavy-duty motor and redesigned paddle provides all the power and efficient churning necessary to create your favorite frozen treats from scratch, and the double insulated freezer bowl ensures fast and even freezing with no mess and no fuss. 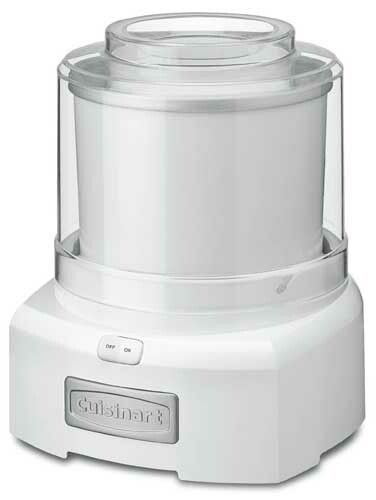 Let’s have a closer look at the specifics of Cuisinart ICE-21 Frozen Yogurt – Ice Cream & Sorbet Maker to see exactly what kind of value and performance can be expected. This unobtrusive model has a compact footprint on the countertop or in the cupboard. Made of sturdy white plastic with a stainless interior to the freezer bowl, it starts producing top quality homemade ice cream as soon as the ingredients are poured in. 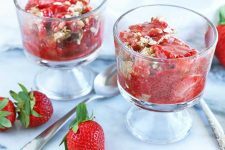 Simple to operate with only an On/Off switch, frozen dessert making is fun and easy, as it automatically churns the right amount of air into the cream mixture for consistent, high quality frozen desserts. The ICE-21 also comes in designer colors: blue, red, turquoise, and raspberry. 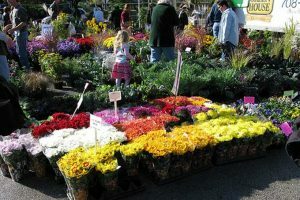 However, availability of particular colors varies and seems to change from year to year. 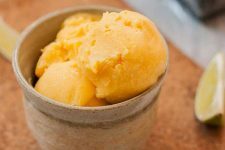 Whether hand churned or electrically paddled, in order to achieve the creamy texture and full flavor of good ice cream, the mixture needs to be mixed while freezing. 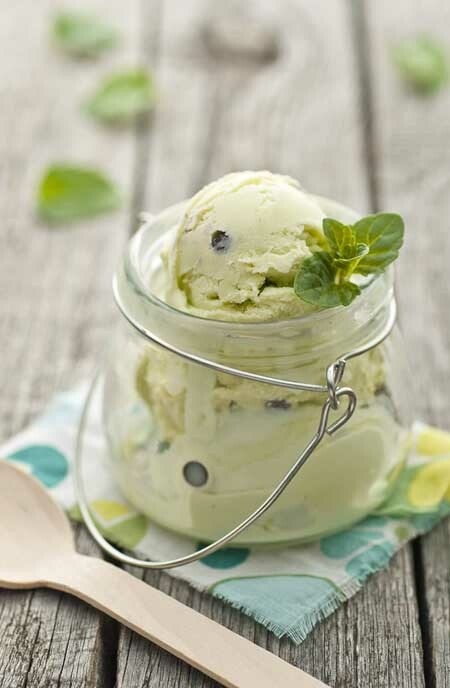 This process aerates the ingredients, which prevents ice crystals from forming, and makes a smooth and rich texture. Units with a built-in compressor such as the Breville BCI600XL Smart Scoop, Lello 4080 Musso Lussino, and the Cuisinart Ice-100 Compressor can achieve this without the need to freeze the bowl in advance. However, they can also be quite expensive. 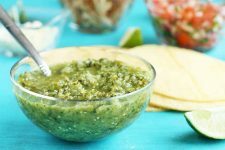 Models with freezer bowls are generally on the lower end of the price scale, but you have to remember to adequately chill the bowl in the freezer well in advance of making your frozen concoction. The mix too should be well chilled before churning. If you forget, your craving will go unsatisfied. 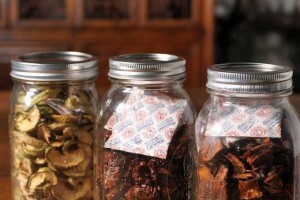 However, with a bit of planning, you can have a stock of your favorite flavors in the freezer for whenever the mood strikes. With most freezer bowl systems, one of the common drawbacks is that they can make only one batch at a time. If another batch is desired, the bowl has to freeze again completely (usually for 24 hours) before using. Or, additional bowls need to be purchased, which takes up more freezer space. 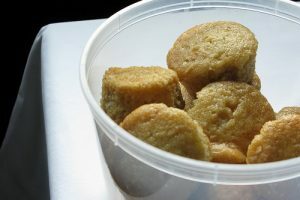 But in going through the many favorable reviews for this unit we found a number of customers who were able to make a second batch because the first developed so quickly, as the bowl was still frozen when they finished. 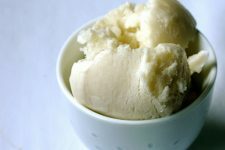 The second batch takes an extra five minutes or so to churn, and the texture is a bit softer, but still very viable fresh ice cream. 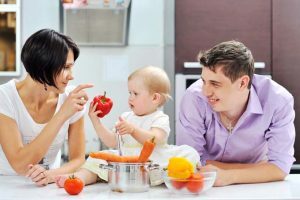 And, without the cost of their own compressor, this style is also substantially more budget friendly – and many people find them perfectly suitable for their at-home needs. 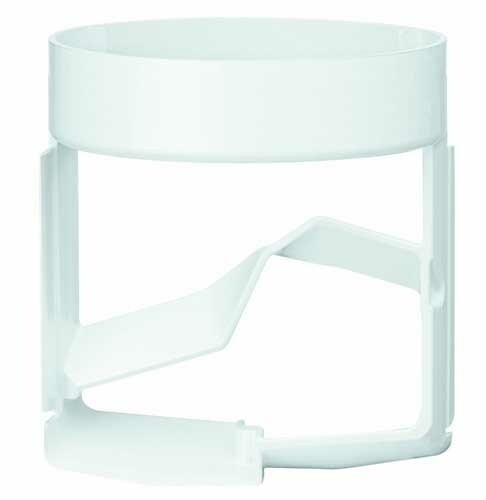 The easy-lock lid is transparent, for tracking the ice cream’s progress during the churning process – and it easily snaps into place on the base while in use. 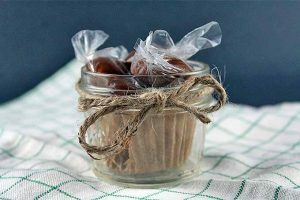 A convenient ingredient spout is useful for adding ingredients such as nuts, chocolate chips, and dried coconut without breaking the freezing cycle, resulting in a creamier, richer texture. Its large mouth allows you to add goodies to the mix easily, minus any unwanted spills or splatters. 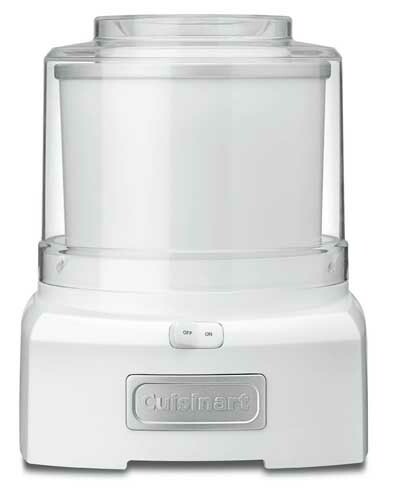 Cuisinart redesigned and improved their patented mixing paddle to aerate and mix ingredients much faster than older models. 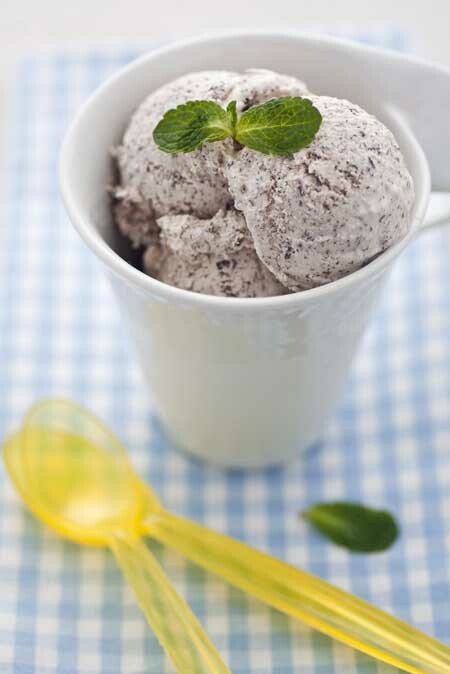 It incorporates ingredients quicker and with more consistency for a faster, more even freeze. The mixing paddle, or dasher, is made of BPA-free plastic. 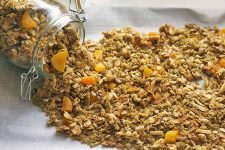 It scrapes the sides and bottom of the mixing bowl, leaving the center clear for easier mixing in of additional ingredients. The double insulated freezer bowl contains a cooling liquid to help with fast freezing, and will stay at an even temperature throughout the entire process, to ensure that your frozen desserts will have the right consistency every time you use this machine. The interior of the bowl is stainless steel, while the exterior made from a sturdy BPA-free plastic. 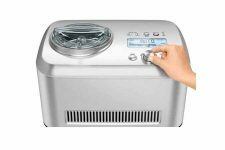 Its strong, 50-watt heavy-duty motor can handle a full batch of frozen treats such as ice cream, frozen yogurt, sherbet, sorbet, or frozen drinks without any loss of power. The base has a cubbyhole for cord storage, keeping any unused cord out of the way, and kitchen counters neat and safe. Simply fold the unused cord into the base. Non-slip rubber feet on the base keep the unit stationary while it’s being used, no matter how slippery the counter gets. Fully automatic, just add the ingredients and the machine does all the work. And cleanup is easy with warm soapy water. NOTE: Freezer bowls are sealed to keep the gelling liquid intact, and should never be cleaned in the dishwasher – hand wash only, please. The ICE-21 also has a three-year manufacturer’s warranty against defects, and it comes with an operating manual and a 28-recipe booklet for creating your own ice creams, sauces, frozen yogurt, and sorbets. This model has a large 1 1/2-quart capacity per batch, and its dimensions are approximately 11 x 11 x 16”, which fits easily on a counter top. The freezer bowl is cylindrical with a diameter of 7” and it is 5.5” high, and the entire unit weighs 9 pounds. Back in the day, it used to take several hours to hand churn a quart of ice cream. Now, you can have over a quart of frozen goodness in under 20 minutes. 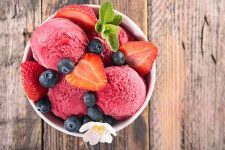 To get the best results, the freezer bowl should be clean and completely frozen before starting on your recipe, and the ice cream mixtures should be thoroughly chilled as well. Freezing time depends on how cold your freezer is, and is usually achieved in 16-24 hours. It’s recommended to place the freezer bowl in the coldest part of your freezer, which is normally at the back. And ensure the bowl is in an upright position on a level surface for even freezing. To check if the bowl is frozen, simply give it a shake – if you can’t hear any liquid sloshing about, then the coolant has reached its freezing temperature. For convenience, store the bowl in the freezer when not in use – if you have the space. And have your mix prepped and chilled for immediate use as soon as the bowl comes out of the freezer, as it will quickly defrost. And just to clarify, no ice or salt is required with a freezer bowl unit. But, the bowl does need to be frozen solid before using, and it cannot be used right out of the box. The ICE-21 is quick and easy to clean, with all parts except the freezer bowl being dishwasher safe. Hand wash the freezer bowl and dry with a soft towel, ensuring that the hole in the bottom where the paddle fits has been drained and dried before storing. For the electrical base, wipe clean with a damp cloth. 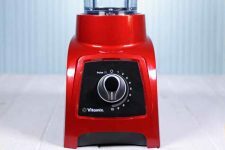 The following is a compilation of the best, and worst, aspects of the Cuisinart ICE-21 as reported by verified purchasers on Amazon. 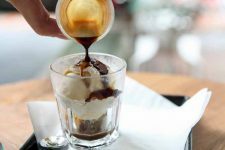 Of the many, many happy customers, by far the most positive comments are that this model consistently produces the ice cream and gelatos desired – nicely aerated, free of ice crystals, with good texture and well-blended flavors. And, that it brings in these results in 20 minutes or less. Satisfied shoppers report that it’s an excellent value for the price. 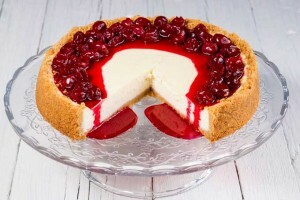 Another highlight is that will create delicious “light” products with the right recipes. 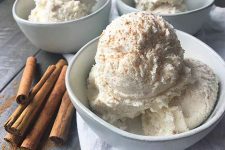 It works equally well with full fat milk, cream or half and half, soy, almond and coconut milks, and alternative sweeteners such as honey, stevia, or agave – making it simple for those with special dietary requirements to enjoy homemade ice cream as well. Directions and recipes are clearly written, and the unit is easy to operate, as is cleanup. Of the critical comments, the most frequent is that the freezer bowl is heavy and awkward to scrape clean. As the dasher doesn’t quite touch the edges of the bowl, frozen cream forms and needs to scraped with a spatula while processing. And without a built in timer, you have to watch the mixture to ensure that overrun doesn’t occur – this is the continued aerating of the mixture after the desired consistency has been reached. There are comments on both sides of the coin about noise levels. 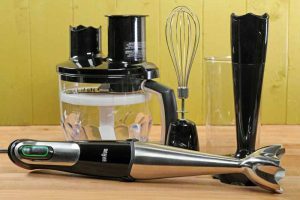 Some say it’s less than a blender or food processor and quite acceptable for the work it’s doing, while others find it noisy and annoying – a personal evaluation to be sure. The ice cream mix needs to be very cold before churning. A couple of hours in the fridge before using, or 30 minutes in the freezer seems best. As with all in-home ice creamers, the finished product will have a texture similar to soft serve. For a harder composition, freeze for a few hours after churning to stiffen. Use a rubber or silicone spatula to avoid scratching the bowl. Take the time to read the manual, and follow instructions for best results. 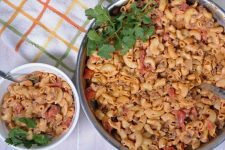 Add the mix-in ingredients slowly and in small amounts about 5 minutes before completion. Adding them gradually will keep the churn going. Invest in a good recipe book to take your ice creaming skills to the next level – Ben and Jerry’s Homemade Ice Cream and Dessert Book is full of great recipes with easy to get ingredients, tips, and advice. 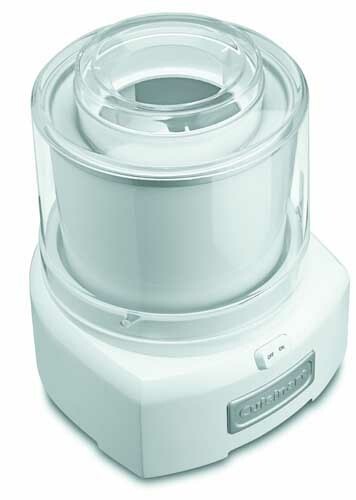 The Cuisinart ICE-21 is a simple-to-operate machine that produces consistently good results, has a nice appearance on the kitchen counter, and offers great value for at an affordable price. A great machine at and even better price. 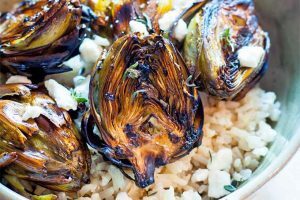 You can't go wrong with this one - especially if you don't want to pay the cost of a compressor model and are content with pre-freezing your bowl. Much more affordable than compressor units, and free of the mess of ice and rock salt models, this machine is a crowd-pleaser with the power and durability to produce your favorite frozen yogurt and ice cream at home, on demand. As long as you remember to freeze the bowl, of course. Very highly recommended by verified purchasers, there’s little not to like about the ICE-21. Want to view more choices? 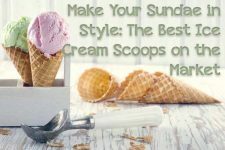 Check out all of our reviews of top rated ice cream makers as well as Foodal’s Introduction to Ice Cream Makers.